Ian is now going a stage further and constructing a full Jordan Array. This left his DCR enclosures in need of a new home. By coincidence, another customer had just bought two pairs of Eikonas with the intention of building DCRs. Claiming that his woodworking skills were limited to making a garden dibber in 1968, Phil looked a potential candidate for Ian’s enclosures, so we put our two customers in touch. “My first week with these speakers was amazing, love everything about them. They have brought my music collection to life! Absolutely brilliant! 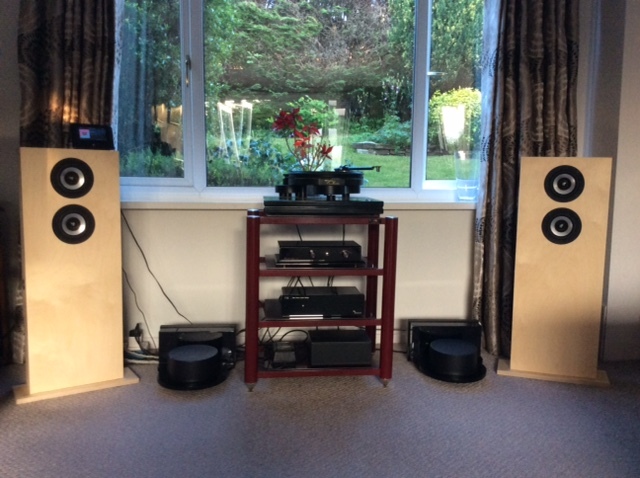 “Many thanks to Ian at Lenco Heaven who built the cabinets and kindly fitted the speakers. You can see the DCRs in their new home in the accompanying photos. This was a very happy outcome and it highlights the level of service we aim to offer at EJ Jordan Designs. When you buy Eikonas from us and embark on a project, we want you to achieve great results. We support our customers with advice and we’re pleased to receive feedback and photos of the finished results. Ted Jordan spent his life perfecting his loudspeakers. We are proud to continue his work and love hearing how his creations bring music to people’s ears. Garrard is one of the most respected brands from the early days of British hi-fi. Many hi-fi enthusiasts began their journey with the Garrard SP25 auto-changer before moving up the Garrard product line to higher end products such as the 301 or 401. 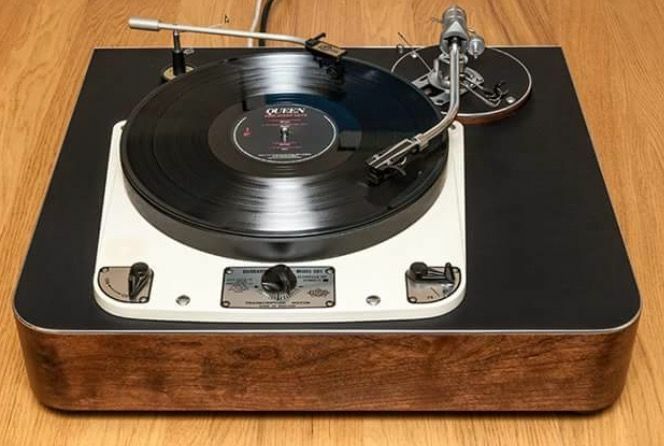 The Garrard 301 and 401 turntables were true transcription quality, capable of outstanding performance at a range of speeds, including 78rpm (the 301 was launched in 1952 when the vinyl LP format was only four years old). These decks came without tonearms and were usually paired with an SME3009 or 3012 tonearm for best results. So it is particularly satisfying that at the beginning of this month, the Garrard brand was acquired by SME from Brazilian company, IGB Gradient. Along with this acquisition was the purchase of Loricraft Audio, the Garrard tuning and repair specialist. For a fascinating history of the Garrard company, visit the Loricraft page here. For further details see the SME press release. This got us intrigued and we had to know more. Paul kindly offered to write up his thinking behind the enclosure and his construction method. A point to note is how clearly Paul set out his aims with this project, before even beginning the computer simulations, let alone starting to build. Note that the plan shown is a sketch and is all we have. A higher resolution is available from us (email for a copy). Click on any of the images for a larger version. 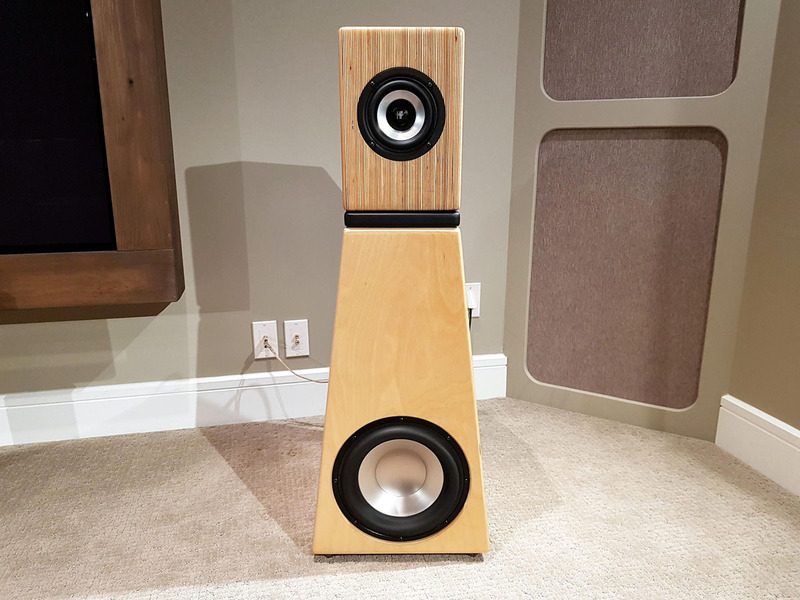 Quite a while ago I started building my own speakers using readily available designs, I made a few sets of two and three ways which turned out really well, and eventually began experimenting with full-range speakers. As luck would have it just around this time Martin J King had just made the first versions of his famous Mathcad spreadsheets available to the public. I decided that I would try and build a set of horn speakers since I had heard so much hype about them. I ran about a million simulations with Martin’s spreadsheets, and what I found was that a straight horn modelled much better than an exponential, or hyperbolic horn, and that a large chamber for the speaker really improved the response. I used the specs for the Jordan JX92S for my sims. 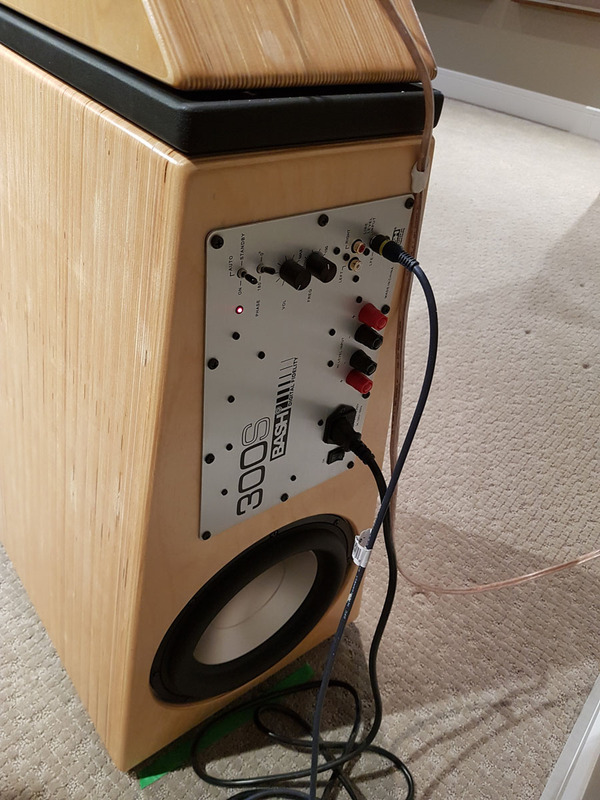 My criteria were: A decent off-axis response, true full-range frequency response, not too humongous in size, and it had to be built using hand tools because that is all I had. I wanted the horn to expand along two axis, not just one as in most of the horn designs that I’d seen. I added a diffraction ring made out of solid maple to help with diffraction effects, to move the driver closer to the horn mouth, and because it looked cool. The driver is set 38” off the floor which is about my ear height when seated. I also wanted a front facing mouth that would couple with the floor to make the room part of the horn. I lined the inside of the horn mouth with carpet that looked like felt, and braced it with oak dowels to keep it from resonating. Warning: this was a challenging build, much harder than a simple box. With the JX92S I needed to stuff the upper part of the horn body with polyfill to tune the bass response, and I needed to add a baffle step filter. My filter ended up being a 1.5mH foil inductor with 6 ohm resistor bypassed by a 0.5 uF cap to help lift the upper end. I used a compared a Radio Shack SPL meter and frequency response disk to measure the in-room response from my listening position, and repeated the same measurements using my 3-way speakers. (Sorry folks, that’s all I had at the time.) The response after tuning was very close to the 3-ways, flat and extended into the high frequencies. The in-room bass response was much deeper than the sims indicated; the early Mathcad models didn’t account for room effects. As a result, I measured output down into the 20’s. These speakers have deeper, more punchy bass than my 10” bass driver, 3-ways. I lived with the JX92S in these horns and enjoyed them for 13 years, they are very impressive for such small drivers. But they did have their warts; the upper mids and lower treble can sound harsh on certain recordings and nothing that I tried over the years could change that. After hearing good things about the Eikona 2’s I decided to take a gamble and try a pair out in the horns. Their T&S parameters are pretty close. I dropped them right in with no adjustments. I’ve had a couple of months now to evaluate them and they are a worthy upgrade, better in every respect than the JX92S. They have greater detail, better bass response, smoother mid/upper end response, and gone is the harshness that the JX92S could show. I’m driving the speakers with a 15 wpc class A amp with no problems, they get way louder than I can stand. They are the most transparent/holographic speakers that I have. My 3-ways ,although they sound great, seem veiled in comparison. All-in-all I am very impressed with the Eikona 2s. I don’t know how they sound in other enclosures, but they do sound great in these horns. 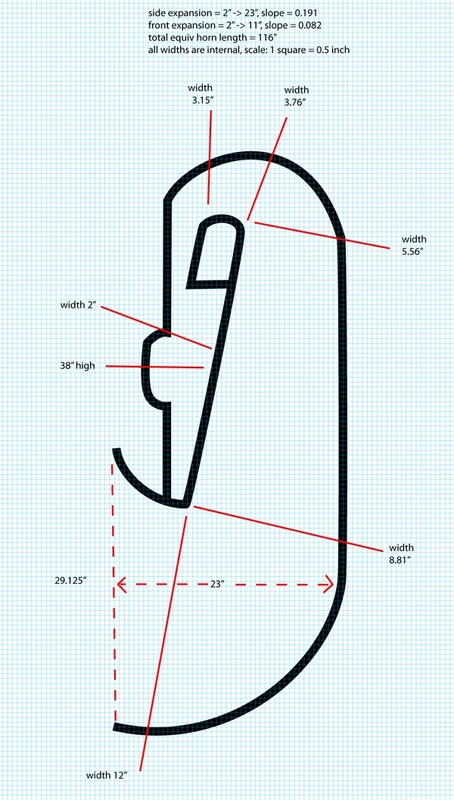 Here is the scale drawing that I used for the construction. One square on the graph paper equals ½”. Sorry that this is not the clearest, but it’s all I have. The horn throat is 2” x 2”, the mouth is 12” x 28 ½”, the horn path is 116” from the bottom of the mouth to throat. The horn is a linear expansion for most of its length and flares out only near the mouth. The speaker chamber was optimized for the Jordan JX92S. 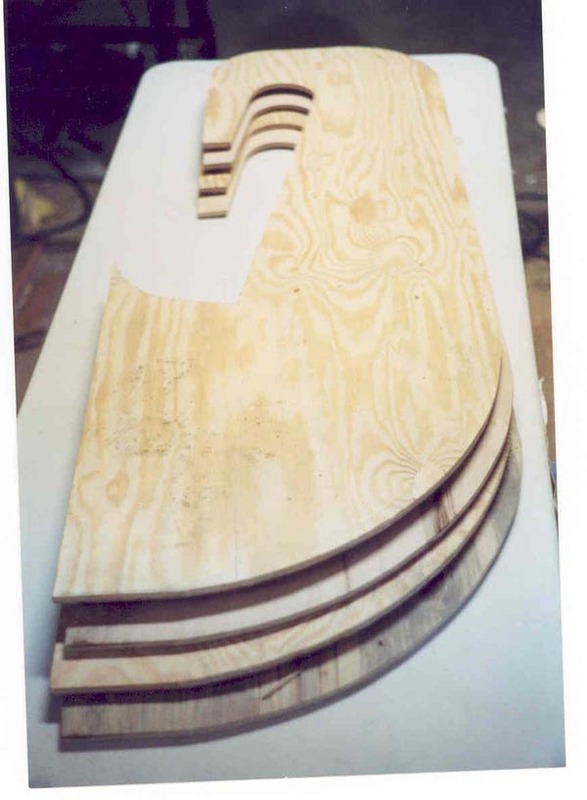 The sides were made using ½” plywood, curf cuts were used near the mouth where it flared out to help with flexibility. I carefully drew the layout on one side and cut it out with a hand-held saber saw, then used the cut out as a template for the remaining three sides. 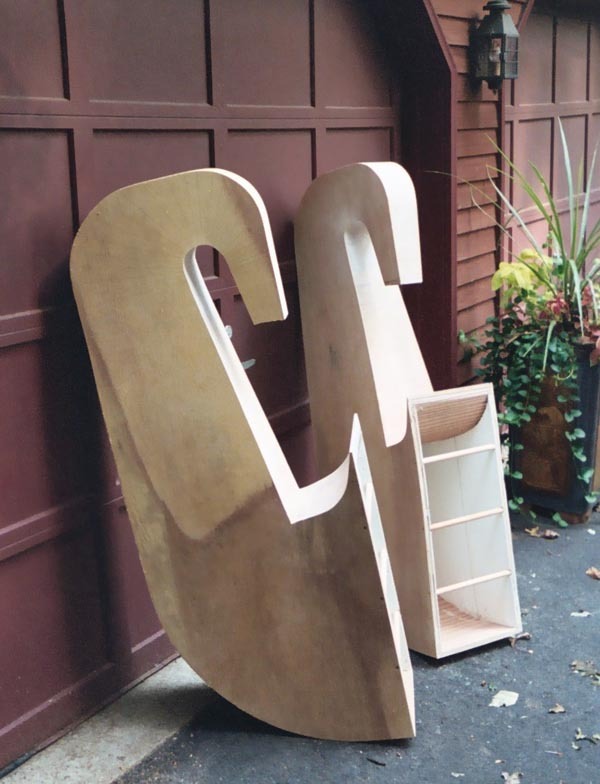 Here is a close up shot of the curf cuts, I used a circular saw to cut them by hand. The curf cuts were filled with construction adhesive using a putty knife to add strength and deadening. 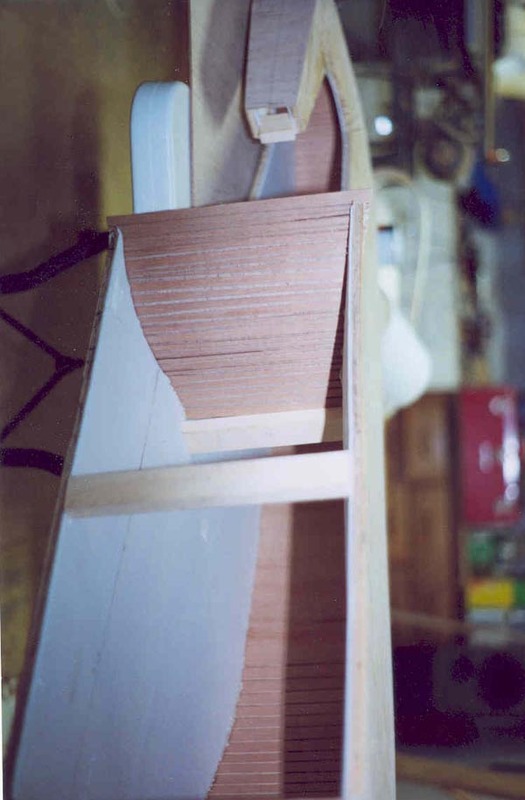 Here is a pic of the first layer of plywood being applied to form the horn body. Note the temporary spacer sticks used to control the expansion, they were removed once the first skin was on the front/back and the shape was stable. Here is a pic of the completed horn bodies, I built the speaker chambers separately and attached them (sorry I don’t have any pics of that part). The sides have a ¼” sheet of underlayment laminated on using construction adhesive, the back is composed of 3 sheets of underlayment laminated together using construction adhesive. The front only has two layers of underlayment laminated because the tight curve was a challenge and the speaker chamber added extra support. 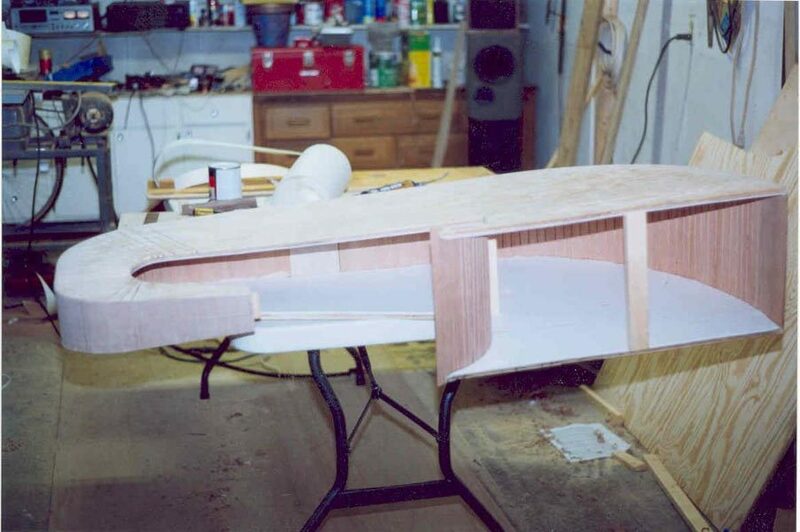 The speaker chamber was made from ¾” plywood and was laminated to the front using construction adhesive and screws. I added oak dowels to strengthen the mouth and keep it from resonating. The speaker chamber was treated like a bass reflex box and was lined with convoluted foam, and some polyfill was added in the final tuning process. The entire horn was veneered with birch, finished with a couple coats of linseed oil to bring out the grain, then a bunch of coats of wipe-on polyurethane was added on top for strength. I used some moulding to finish off the mouth edge to hide the plywood end grain and for a finished look. I used two rubber feet under the front of the mouth and one leg in the rear to stand the horns on the floor. I recently purchased a pair of your Jordan Eikona 2 Drivers from Wilmslow Audio. I was really keen to have access to great sound quality at home, and after a lot of research chose your drivers and your VTL design. I wanted a pair of speakers which were really realistic, detailed and musical. I was also drawn to the idea of one driver per speaker and no crossover. I am a professional cabinet maker and wanted to machine and build the cabinetry myself over the 2017 Christmas break. 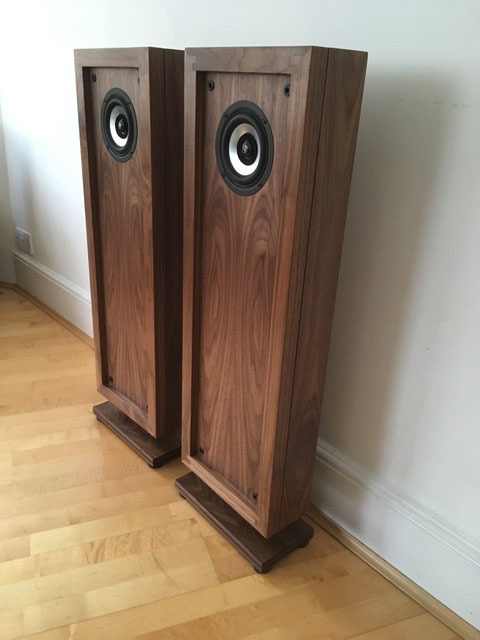 I spent 2 weeks making the speakers, which was a really enjoyable process. I kept all the dimensions as per your drawing apart from the walnut framing which added a bit of extra depth to the exterior to take the speaker grille (note the actual baffle where the driver is mounted is positioned as per your recommended drawing). I also made the foot slightly deeper to follow proportions of the slightly deeper cabinet. My aim was to make a cabinet which displayed craftsmanship, complementing the Eikonas and the music played through them. Walnut veneered birch ply cabinetry. The veneers on the fronts/backs are book matched for visual interest. The top, back and sides are constructed as a mitred box and the grain wraps around the cabinet. Veneers were chosen from Capital Crispen veneers. Mitre joint with rebate and tenon. The feet were made up from a cross ply lamination of solid walnut. Visually I like to highlight long grain against end grain, and it also adds a great deal of stability to the timber, ideal for a foot. Project Damp it sound isolation rubber feet. These are slid onto dowels on the walnut foot. 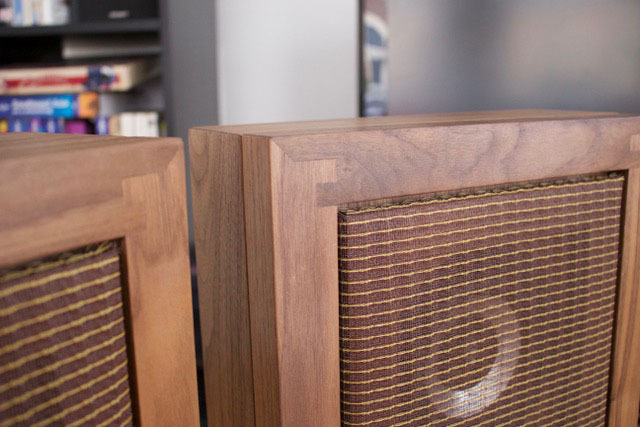 Fender style speaker grille wrapped around a walnut frame. Oxblood with gold stripe from All Parts. These are fixed to the speaker using Wilmslow Audio standard grille fixing studs. Finished with two coats of Osmo Oil (clear satin matt) and a final coat of Liberon black bison wax polish. Whilst building the speakers I spent some time thinking about what songs in particular I would like to trial once the speakers were made. I narrowed it down to two songs. The first song I chose was ‘Holding Hands’ by The Magic Lantern. I chose this track as I knew the song featured some interesting layering of instruments and an emotive vocal line. I was really pleased with the clarity of the saxophones and the VTL’s ability to distinguish them. Each line was so detailed you could hear all the subtleties and accents made by each musician and their instrument, making it quite an intimate experience. In my opinion, these are all characteristics which allow you to listen to the song in its true form, how the musicians played it and how the song would have been heard in the studio. The second song was ‘Tethered’ by Rationale. I chose this song as a contrast. I wanted to hear a multi-tracked song which used synthesised instruments. Firstly I was struck by the sense of weight the VTLs produced (even at low levels). There were times you felt very grounded by the bass. I think the depth of field the VTLs produce is my favourite part, in my opinion as a result of their ability to access the full range. These were just some details that stood out whilst listening to two songs. I have enjoyed listening to many other songs through the VTLs, and am constantly hearing and feeling music in a new light. They really do allow you to hear the full picture, where you have no option but to sit and listen. Simon has indicated that he is very happy to undertake commissions for the Jordan Eikona, whether based on the VTL or any of our other designs. Visit the SR Woodworks Facebook page or contact us and we will put you in touch. Last year, we published a series of blogs entitled Audio Building Blocks. We examined how the Jordan Eikona full-range driver could be used in a number of different ways – from simple, single-unit systems to loudspeakers incorporating 16 Eikonas per enclosure. 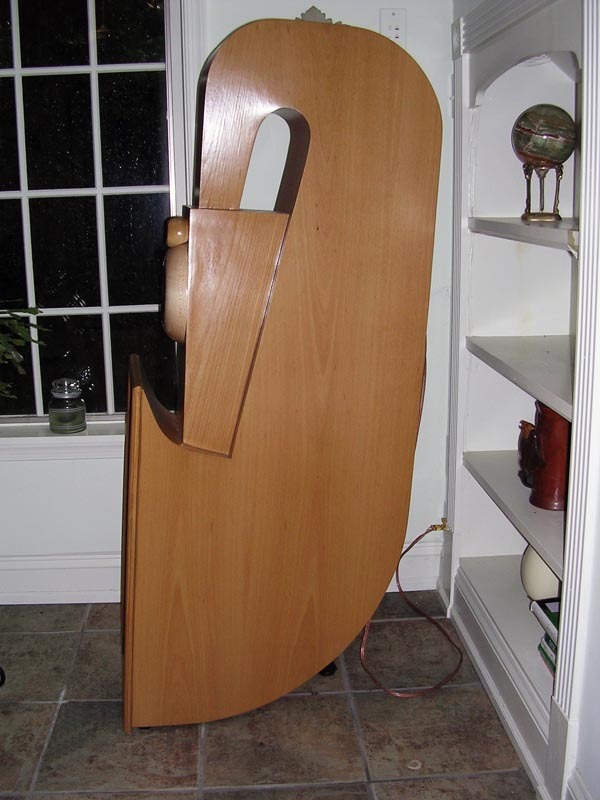 To start this year, here’s another way to use the Eikona; add a bass unit. Although this involves a crossover, if it is set at a low enough frequency, the use of a crossover won’t disturb the imaging or midrange detail of the Eikona and will relieve it of having to reproduce low bass notes. In this way, the system as a whole will play louder and cleaner than could be accomplished by a single Eikona. Just such a system has been built by Chris, one of our customers in the US. 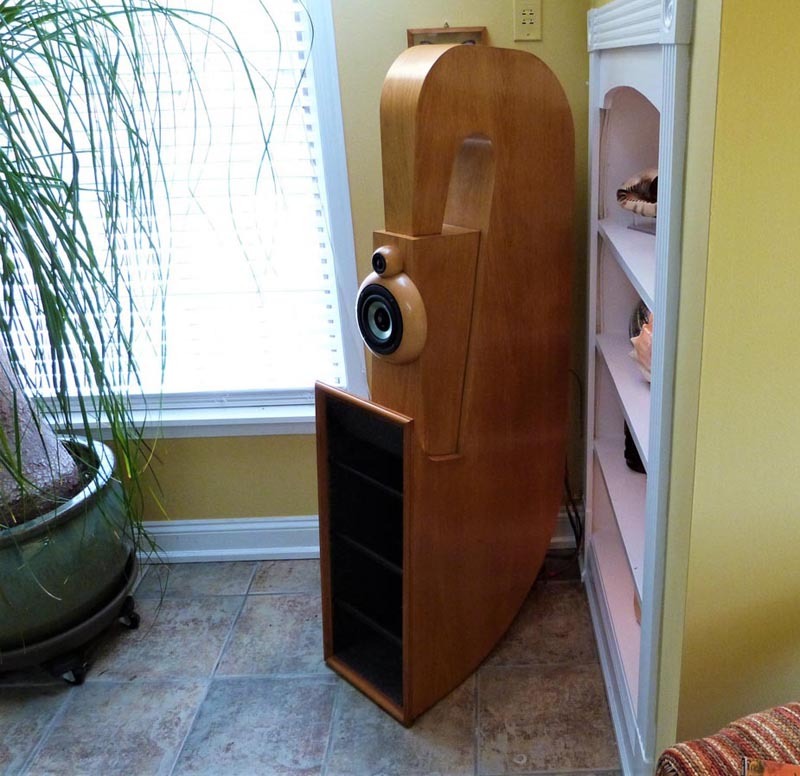 It is a very attractive, high-end loudspeaker which is being used in a dedicated music and theatre room (notice the plumbed-in wiring and the bass traps in the corners). The Eikonas are mounted in 5-litre sealed enclosures built of 25mm Baltic Birch. They operate from 120 Hz upwards whilst music below that frequency is handled by a SEAS subwoofer and passive radiator. The crossover is electronic and the bass system is powered by its own amplifier, built into the back of the enclosure. “I was hesitant to try the Eikonas because of their cost … [but] I can say that I’m not disappointed I took the leap. In my opinion, the Eikonas are worth every penny and they are nothing short of amazing! … In general the Eikonas have a fullness to them and a more relaxed and smooth feel… they are extremely detailed and image well. The soundstage is huge and the music has depth to it. I have them in sealed cabinets and crossed at 120 Hz to the subwoofers. They are extremely smooth and yet detailed! Best I’ve heard to date! I’m sure they will only get better as they break in but so far I’m very happy!! The subwoofer is tuned to 25Hz, F3-31Hz, F10-22Hz. With room gain easily into low 20s… But for me, more importantly, the bass is extremely clean, crisp and controlled. 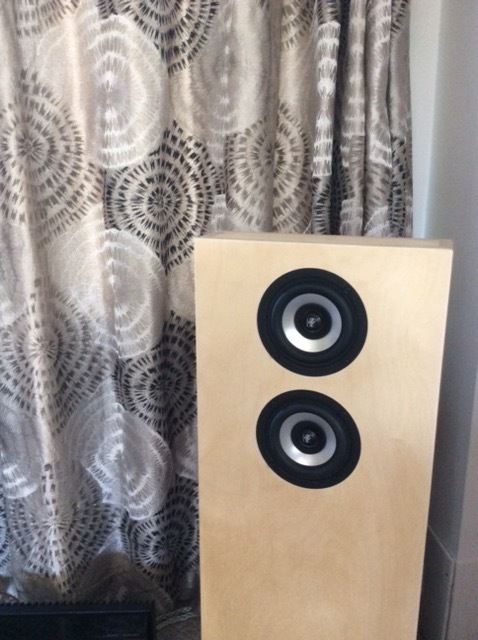 As always we are happy to receive photographs and information about loudspeakers you have constructed using the Jordan Eikona. Email them to us or contact us via our Facebook page. Keep up-to-date with the latest EJ Jordan news by signing up to our newsletter. If you are building an Eikona-based loudspeaker – whether one of our published designs or your own – we are always available for advice and support. Christmas is a time for giving, a time for receiving and … a time for sprouts. 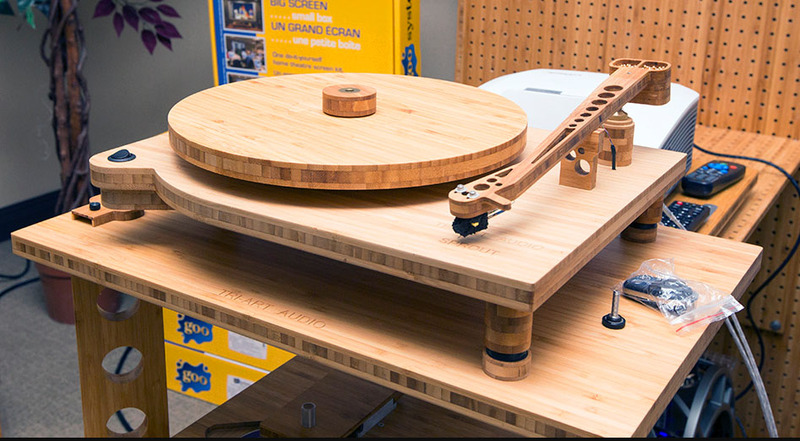 So here’s one for fans of the EU capital and vegetable; an unusually-named turntable (the Sprout TA-0.5) made from an unusual material – bamboo. 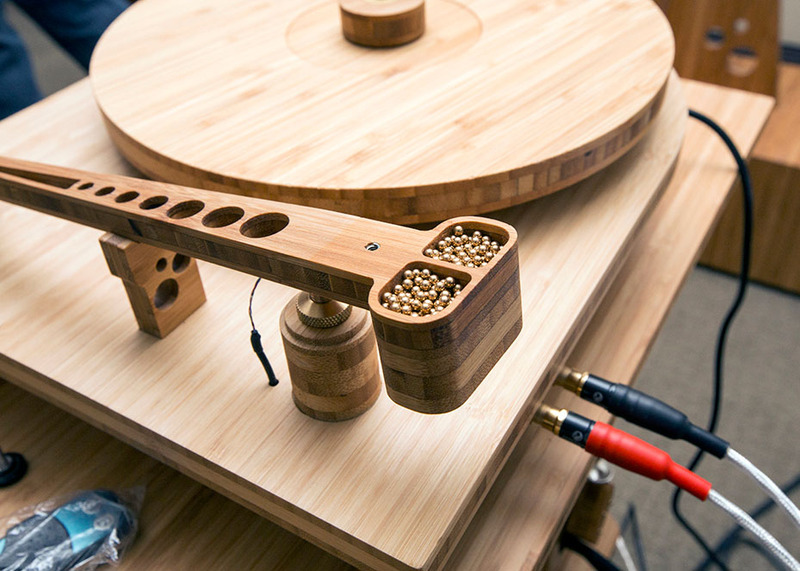 The plinth, platter and tone-arm are all manufactured from bamboo. The well-established Canadian manufacturer, Tri-Art, claims it offers superior stiffness, lightness and better audio qualities. In addition to which, it is a very ecological material and a refreshing change from boring plastic or MDF. The arm is idiosyncratic too – it features a counterweight which consists of two little bowls filled with brass balls. 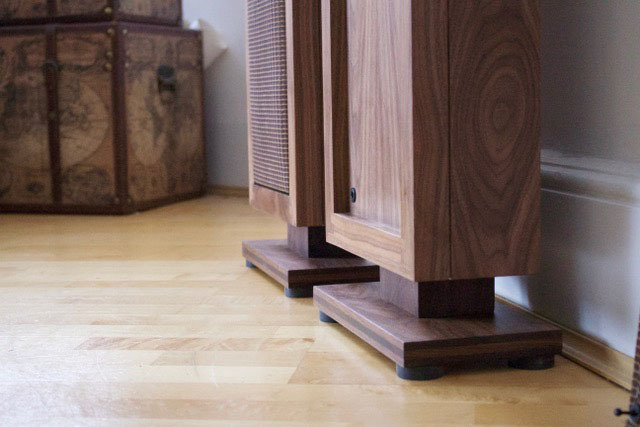 The BBC LS3/5a monitoring loudspeaker is a true hi-fi classic. Apart from the QUAD ESL57, it’ is difficult to think of a loudspeaker that has been held in so much respect for so many decades. The LS3/5a was designed as a compact monitor for use outside broadcast vans, but its performance outstripped the original brief and it found its way into monitoring suites throughout the BBC. On a visit to Bush House, shortly before the BBC World Service moved from there, I noticed dozens in use in studios and newsrooms throughout the building. The BBC completed the design in 1972 and licensed its production to a number of companies from 1974 onwards, most famously Rogers. The loudspeaker continues to be manufactured by licensees today, although most of the companies now making it (with the honourable exception of Falcon Acoustics) use different drivers from the KEF B110 and T27 originally specified. This unassuming, high quality monitor was quickly adopted by hi-fi enthusiasts for its natural, uncoloured sound and its glorious midrange. In 1976, UK magazine Hi-Fi for Pleasure featured a ground-breaking comparison between 30 commercially-available loudspeakers. In the articles, Martin Colloms subjected an experienced listening panel to a series of blind auditions, the conclusion of which was that the LS3/5a was more accurate than most of the tested designs including the Spendor BC1 and QUAD ESL57. 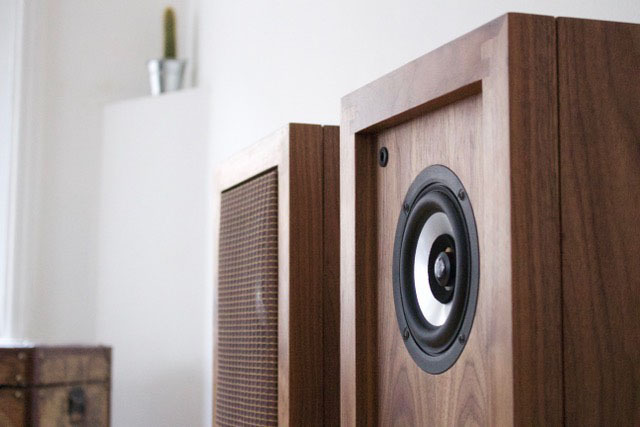 Critical to its performance is the very tightly-specified cabinet construction, which one writer estimates costs as much to make as many complete loudspeakers. We were curious about this and for a couple of years have been running a pair of Jordan Eikona 2 full-range drivers in genuine BBC cabinets, manufactured by one of the current LS3/5a licensees. The internal volume is an excellent match for the Eikona and we have been very pleased with the system’s performance; the sealed enclosure rolls off the bass below 85 Hz with an ideal 12 dB per octave slope. Combined with a good sub-woofer such as the BK XLS200, they make a superb, full bandwidth, stereo system. 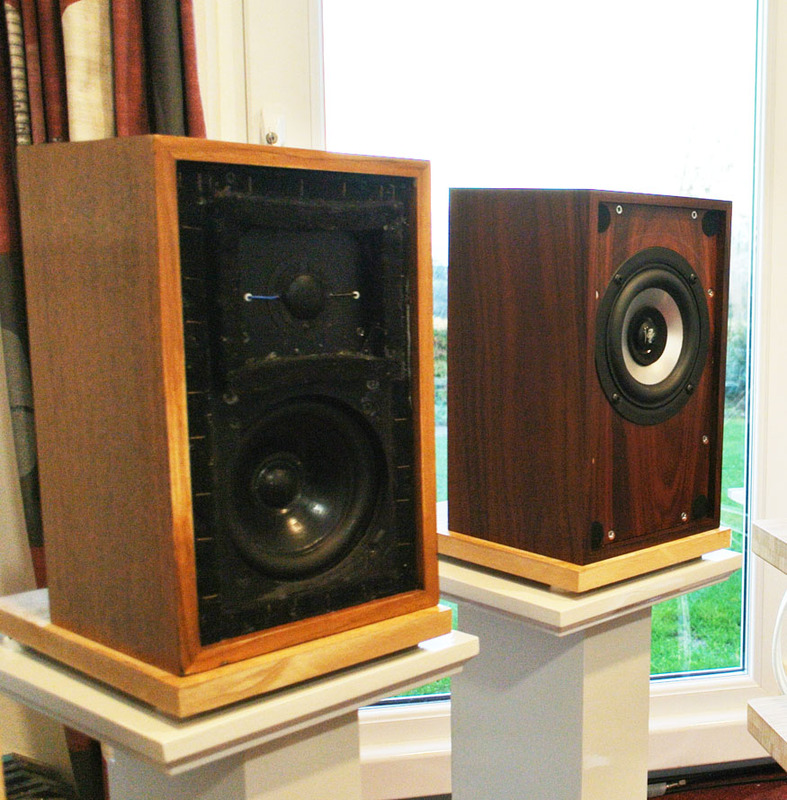 We recently had the opportunity to test our Eikona/BBC cabinet speaker against a pair of original Rogers LS3/5as. These were serial numbers 357 and 358, so a very early production pair (over 43,000 were produced by Rogers and up to 60,000 have been produced overall). These were the 15 ohm version, which is generally preferred by aficionados over the 1980s 11 ohm variant. 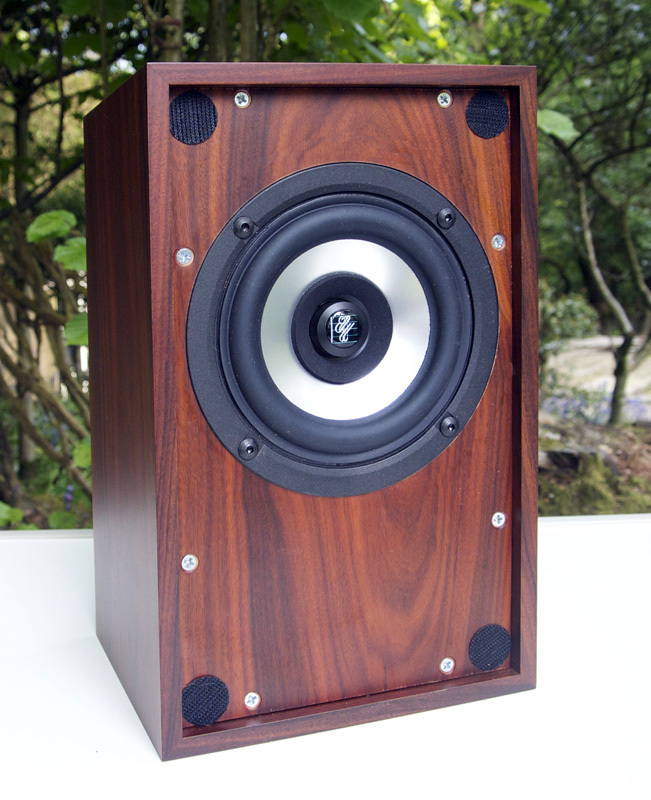 The speakers had been carefully restored and brought back to full specification. 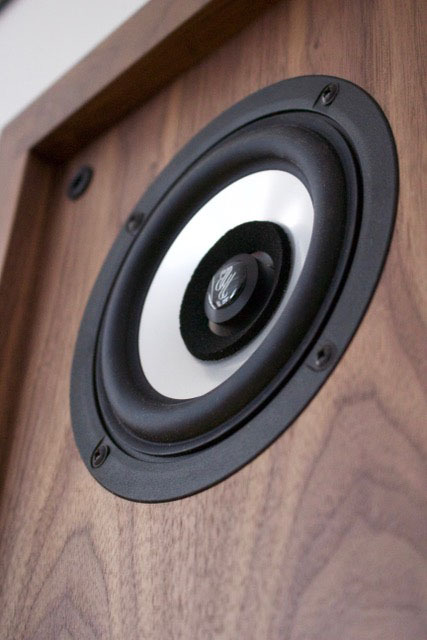 The LS3/5as sounded wonderful; warm, involving and with an excellent stereo image. They couldn’t handle a lot of power but they certainly benefited from a good amplifier; their owner had been disappointed by the sound when originally purchased and only recently found out what they were capable of when he upgraded to a high- end amplifier. We then switched to the Eikona/LS3 cabinet combination. Some adjustment was necessary as the crossover-free Eikona is 4-5 dB more sensitive than the LS3/5a – once that was done, we could enjoy the differences. The Eikona gave a broadly- similar, accurate sound but it was cleaner in the treble and throughout the mid-band. It also sounded quicker, with a wider and more focused stereo image. The LS3/5a owner preferred the Eikona’s presentation and commented that the midrange was noticeably better. The LS3/5a sounded warmer in the bass and at first sounded as though it reached lower. This was due to the famous ‘hump’ in the LS3/5a’s bass response, a slight boost around 160Hz designed to give the impression of more bass than the design is truly capable of producing. By comparison, the Eikona/LS3 enclosure is more accurate in this region and rolls off at a slower rate. It doesn’t sound as beguiling on first listen, but it makes the system more amenable to tuning or the use of a separate sub-woofer. It was a fascinating comparison. 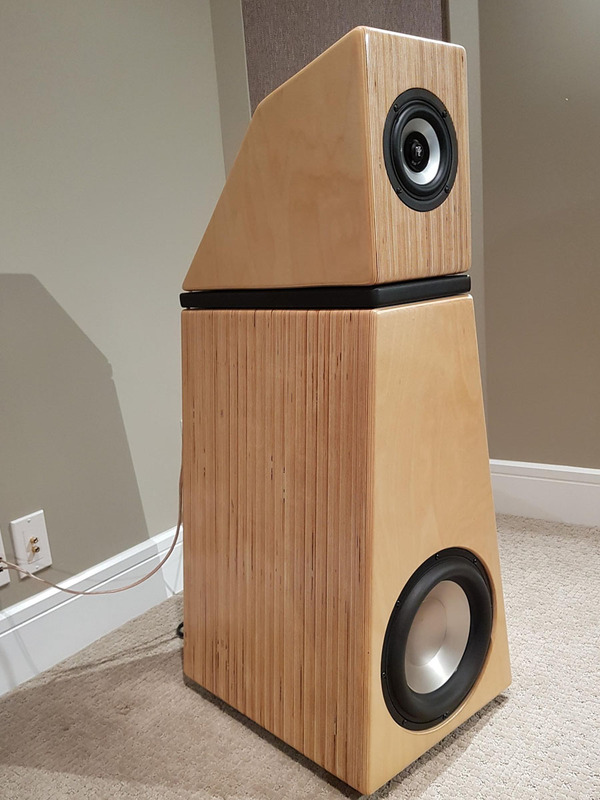 It may seem odd to compare a modern, full-range design with a 40-year-old speaker with a complex crossover, but the LS3/5a’s reputation for accuracy made it a very valid test. It is rare to have the opportunity to compare designs like this in what is basically the same, tightly-specified cabinet. The Rogers BBC LS3/5a is a wonderful loudspeaker and we are pleased that it demonstrates just how well Ted Jordan’s Eikona 2 performs. Vinyl and turntables are becoming all the rage at the moment, and not only among audiophiles. 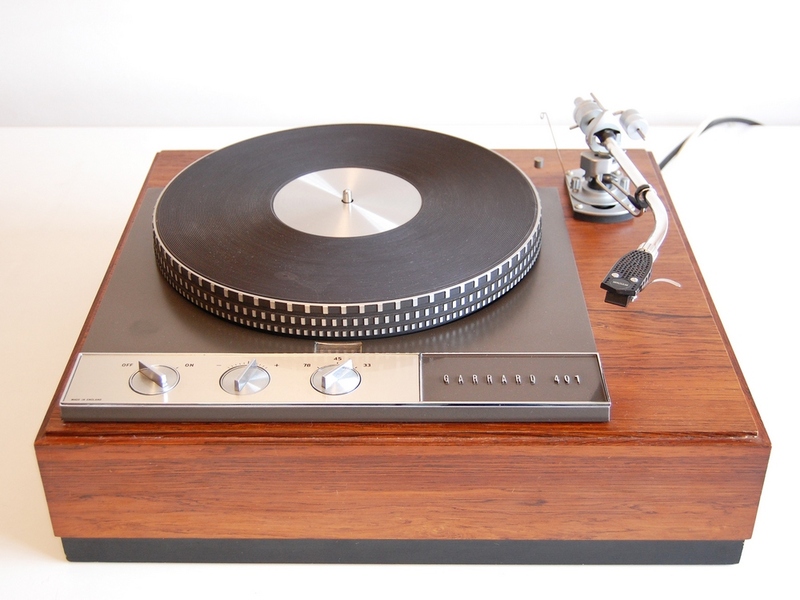 Turntables have a retro appeal that reaches a wider market. 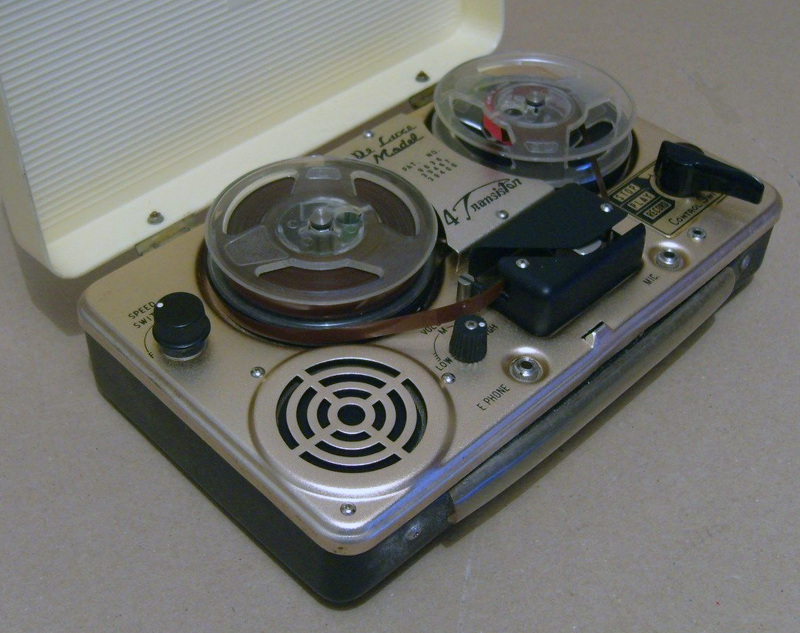 Although there is something even cooler than a turntable – a good, open-reel tape recorder. Here at Jordan Towers we’re big fans of open reel. A good machine can provide recordings and playback that rivals digital. They also look good, especially the larger, studio-orientated machines. But how about something a little smaller? Currently on eBay there is a Japanese Honeytone machine for spares or repair. 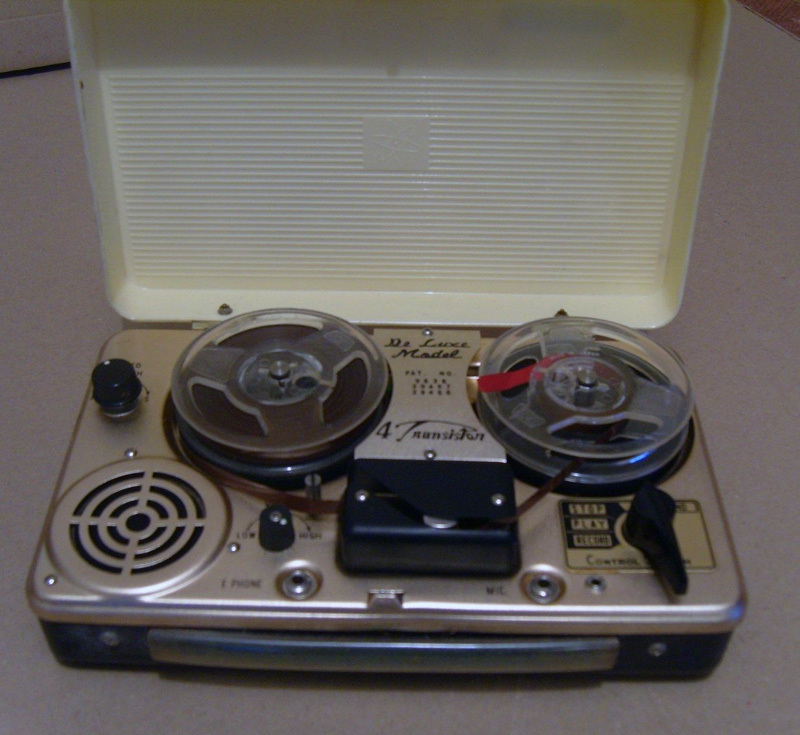 It only takes 3 ¼ reels, so you’re not going to get Wagner’s Ring Cycle recorded on it. On the other hand, it does have a groovy, Mission Impossible vibe. These machines date from the early 1960s, so they’re definitely retro! These machines look so good, you could buy one purely for display purposes – just to prove how cool you are. 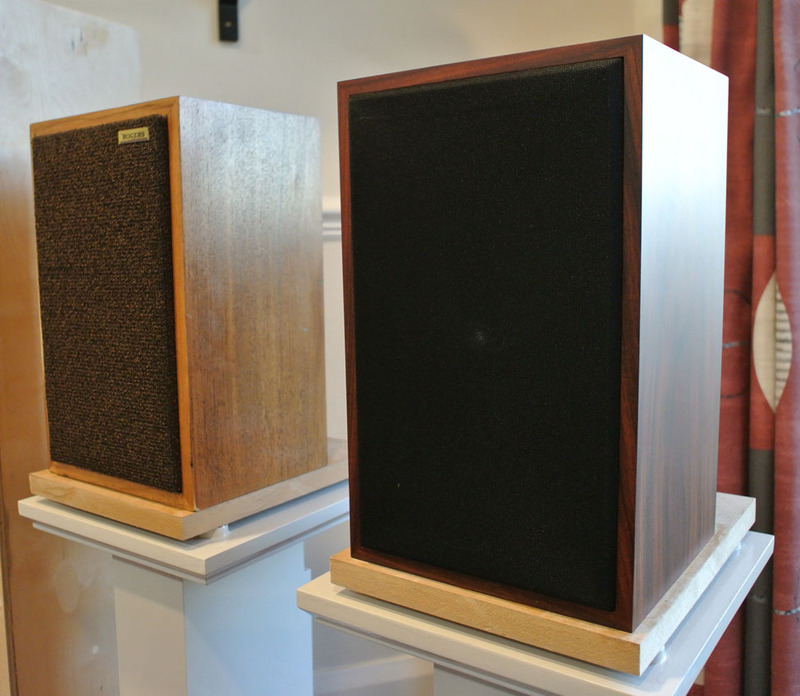 The simplicity and purity of Ted Jordan’s full-range approach to loudspeaker design lies outside the hi-fi mainstream. The conventional approach is to split the music with a crossover and send it to multiple, dissimilar drive units. But more manufacturers are seeing the benefits of the Jordan design ethos and, in particular, the clear advantages of using our Eikona 2 drive unit. The latest company to release a complete, Eikona-based system is BK Electronics. Although BK are more famous for their world-beating range of subwoofers, they have already featured the Eikona in a loudspeaker based on Ted Jordan’s VTL design. They have now released the elegant BK Eikona Reflex 7, a bookshelf speaker which uses a single Eikona full-range unit in a compact, 8-litre enclosure. 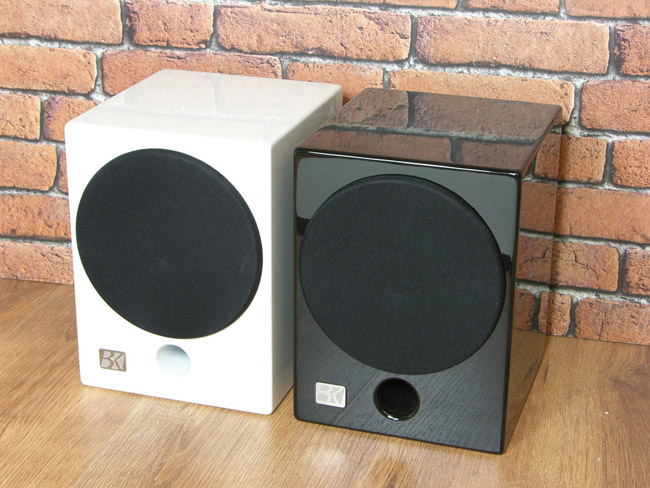 The speakers are available in gloss black or white and have a couple of unusual features. The first is a speaker grille held in place with concealed magnets. This avoids the usual, visually-intrusive fixing points if the loudspeaker is used with the grille removed. The second is a dual set of connectors which enables the loudspeaker to be used with an optional small resistor in series with the unit. This helps to give more bass weight to the sound when the Reflex 7 is used on stands, away from nearby walls. 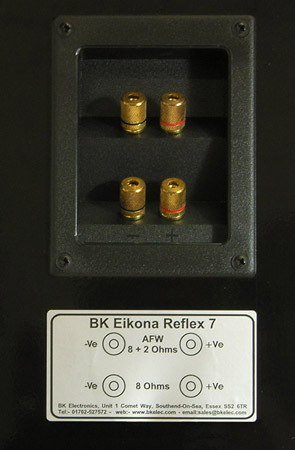 The BK Eikona Reflex 7 is available now, direct from BK Electronics, for £734 including VAT and UK shipping. 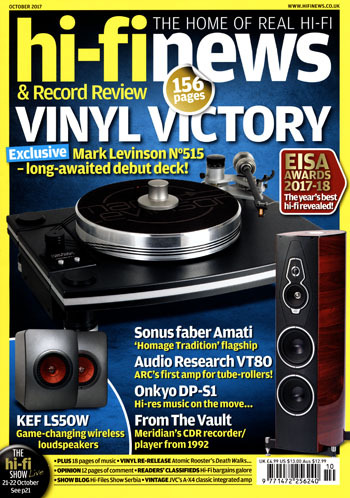 Hi-Fi News & Record Review is probably the most prestigious audio journal in the world. It was first published in 1956 and it is home to a range of respected journalism and technical reviews. Ted Jordan’s writing has featured in its pages on more than one occasion. 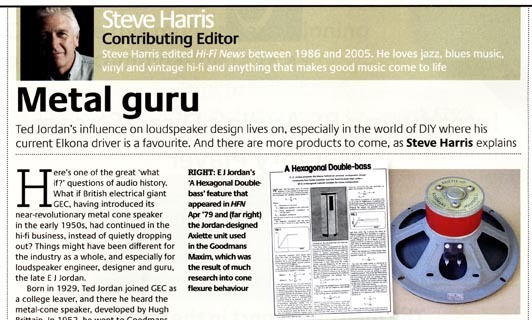 We are very pleased to announce that the October 2017 issue features a profile of EJ Jordan Designs written by Hi-Fi News’ former editor, Steve Harris. We met Steve recently at an event in London and he was keen to find out how the company is developing since the passing of founder, Ted Jordan. Steve’s article explores the history of the company and gives some hints of developments to come. For the full article, rush out and buy Hi-Fi News! It is also available on subscription here.